If you were a Laguna Beach fan like me, you would remember the episode when Kristen says “What happens in Cabo, stays in Cabo.”, and of course they have a wild and crazy spring break adventure. Cabo was not my first choice for a destination vacation, but the timeline worked; my boyfriend and I had both never been and it was a hot destination to getaway from the most intense Vancouver winter. Our trip overlapped with American spring break, so we did have a couple James Franco “Spring Break forever” moments, however I am not complaining at all, we had a wonderful trip. If you know me, you know that I am an old lady. I like to go to bed early and wake up early so I can make the most of my day. I am a PG-13 person, with a two drink max and an advocate for doing the right thing. Not exactly the party person you want on your spring break trip. San Jose was my jam, it is very quiet, away from the party scene. We stayed at the Royal Decameron which is a smaller resort located directly across from a grocery store. The bus stop is very close by and only 37 pesos ($2.50) and a 30 minute drive to get into town. $40 for a cab, unless you have more than 4 people then they charge you $10 a person.San Jose, although quieter, has an assortment of restaurants and bars that you can visit. San Lucas is like being in Vegas, along the main strip and the marina, people hassle you, offering water taxi rides, cigars, silver or excursions. It is right in the middle of the action, in close proximity to the legendary arch, Medano beach, Lover’s beach and Divorce beach. If you want the true spring break experience, I would recommend staying in San Lucas. All the big night clubs are in San Lucas and they stay open until 6 in the morning. I struggled with this one, I did hours and hours of research trying to figure out what to see while we are in Los Cabos. I kept thinking that I was missing out, the one thing that was tricky is most of the things I was interested in doing, were quite a ways away (about 2 hour drive from San Jose/Los Cabos). We were there to relax we decided to opt out of having a long Mexican van ride adventure. We took the most expensive route, and we booked a cruise on the Caborey. We got a good price, because we booked it at La Comer, which apparently has travellers discounts. Instead of paying $79 USD, we got our tour for $45 each. If there is one close to your hotel, I would recommend you check it out. The Cabarey snorkelling tour was basically a booze cruise with activities. It drives by the arch, and the famous beaches, then heads to Chileno Beach for snorkelling and paddle boarding. The cruise is 3 hours and includes a delicious fajita lunch, all you can drink and a few whale sightings. The crowd is a mixed bag so don’t expect a party boat. The less expensive option is a water taxi, the water taxi fare should be no more than 10 USD, otherwise you are getting juiced. The water taxi will take you to the beaches and the arch. Make sure you get with a glass bottom so you can look at the all the fish. Grab some beers and some snacks and make an afternoon of it. The driver will offer to drop you off at the beach and then pick you up in an hour or so. I usually hate going out, but when in Cabo, you gotta do what you gotta do. We ended up going here twice. We went out on the Saturday night we got there and then again the night before we left. From the street it looks pretty tame but when you get inside it is crazy! In total vegas fashion they have monster glasses for between $12-$15 depending on the liquor. If you like flashing lights, confetti, cages and striper poles, this is your spot to party. To be honest though, they are all so similar and since there is no cover you might as well just roam the strip and see them all for yourself. I love love love love love Mexican food, especially Quesos Fundido, which I learned is just cheese fondue in English. I like to leave the resort and try to have an authentic experience, which is sometime hard. From the research I did, all the places that were recommended in blogs were very westernized and did not feel authentic at all. They were also quite pricey. I chose the two places that looked the most ‘Mexican’. The two that I liked the most, are for two different reasons. You don’t necessarily have to seek out the best eats, because to be honest, we had food at random hole in the wall and it was still pretty damn good, so I don’t think you can go wrong. It was quite the adventure to find La Lupita, non of the locals have heard of it. I was shocked to see that it had an hip urban feel, with dimmed light, giant sugar skulls on the walls and distressed wood tables.They have a wide variety of micro-breweries on the menu as well as an assortment of Mexican fusion tacos. The Al Pastor in the cheese shell is AMAZING. It was not exactly the locals experience I was hoping for but it was still cool to check out and the prices are very reasonable in in-comparison to Canadian pricing at a similar setting. An added bonus, it is right next door to Baja Brewing, which has a beautiful rooftop patio and an assortment of microbreweries on tap as well. We ordered the volcano with flank steak and pork (which is picture above), along with Quesos Fundido. This spot felt a little more authentic, however there were only tourists eating there. The prices are very reasonable, the staff are great and this was by far the best meal we had in Los Cabos, hands down. I was nervous about Los Cabos because I had heard mixed reviews. I am happy we went and I would go so far to say that I would consider going back in the future. The beaches aren’t as pretty as the Caribbean side, but they have their own charm. The one thing that is nice is the dry dessert heat, with very little humidity. It also gets cool in the evenings. The quick flight (4 hours from Vancouver) is painless and there is only an hour time difference. The only downfalls I found are that you can only swim in about 20% of the water and since the area is very fast growing a lot of the attractions are very Americanized. The Thursday Night Art Walk that were so famous on the internet, predominately caters to tourists, the locals know nothing about it. 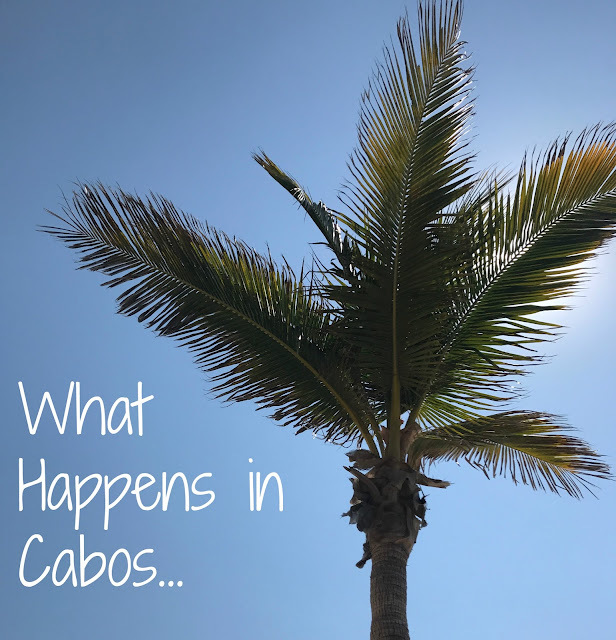 I recommend Los Cabos for anyone who wants a relax and recharge vacation, with not many activities, hanging out at the beach, going for drinks, booze cruises and perhaps snorkelling or scuba diving. Have you been to Los Cabos? Let me know in your comments below what are your must-see spots to visit.